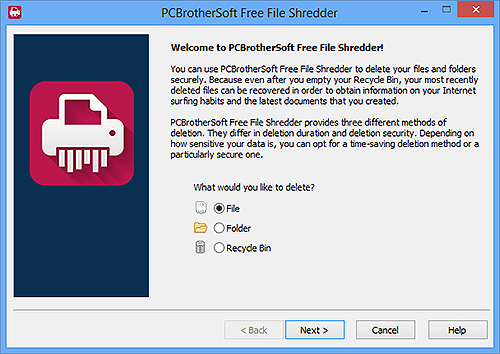 PCBrotherSoft Free File Shredder- How to Shred Files? 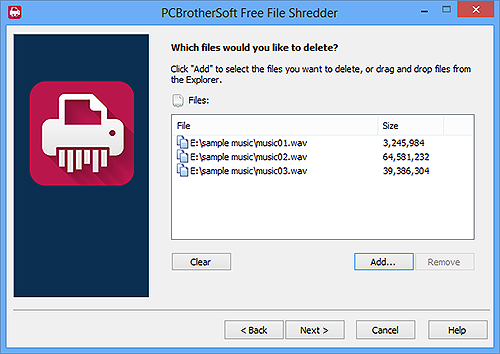 There are 3 options for deletion: File, Folder & Recycle Bin. Click "File" to delete files. Click "Next" and then click "Add..." to choose more files to shred. Click "Remove" or "Clear" to remove one or all selected files from the list. 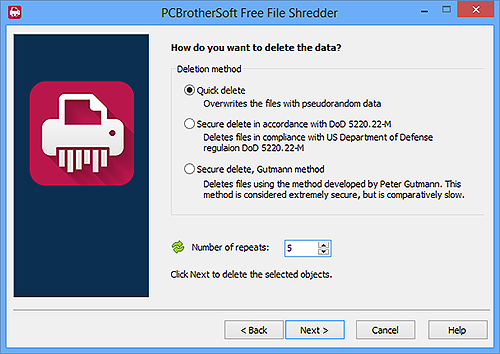 You need to select the deletion method from the 3 options: Quick delete, Secure delete, Secure delete and Gutmann method. The deletion times can be customized by adjusting the number in the box. When all settings are done, click "Next" to start deletion. © 2006-2015, PCBrotherSoft Co., Ltd. All trademarks and copyrights are licensed to their respective owners.